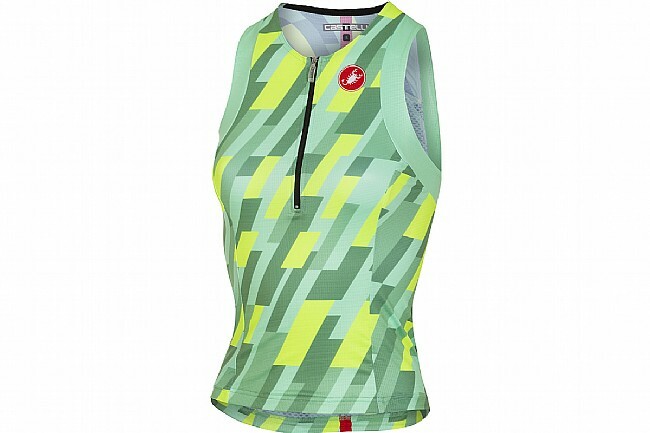 Castelli's Women's Free Tri Singlet features a half-length front zip for adjustable ventilation and soft-finish arm holes to prevent irritation. The front is made of SpeedFreak race fabric while the back is Velocity Mesh -- both light, aerodynamic, and highly breathable. The SnapLock fastener at the lower back attaches to shorts to keep things stable and flat against the body. Two aero- and hydro-optimized rear pockets provide storage.